The Library envisions that it will fulfill its unique role as a major contributor to the academic, cultural, and social development of the college community. 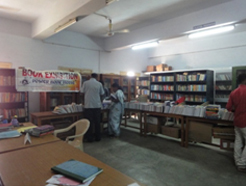 Modern Library should support research and learning community by discover, preserve and disseminate knowledge through Physical and Digital content this is what exactly GAC Library is doing. OPAC allow users to find what's available in the Library and can be searched for Author, Title, Keyword and Subject. 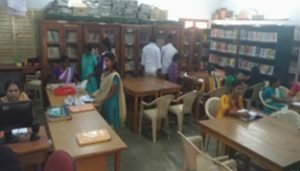 One Day Innaguration of Reading Club was conducted as part of the Student Development Program on 22nd February2016. 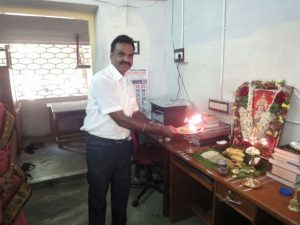 Dr.R.Joseph Ponniah, Associate Professor Dept of Humanities, NIT, Trichy , as Chief Guest, inaugurated the Reading Club and gave a special lecture on reading as an effective tool for language acquisition. 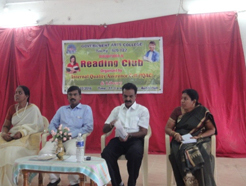 IQAC & Library of Government Arts College ,Trichy -22 jointly organized the inauguration of Reading Club on 22/2/2016. Dr.R.Joseph Ponniah, Associate Professor Dept of Humanities, NIT, Trichy , as Chief Guest, inaugurated the Reading Club and gave a special lecture on reading as an effective tool for language acquisition. He insisted on casual reading which exposes readers to all aspects of language skill. Dr.R.Thiyagarajan, Principal, presided over the function, while Dr.S.S.Jansi Rani, IQAC Coordinator, welcome the gathering and Dr.R.Poonkothai, Librarian, thanked everyone present. 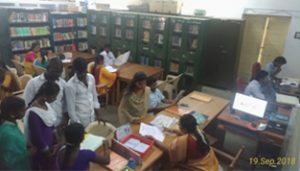 Saraswathi Pooja : As a part of Extension Service Library conducted Saraswathi Pooja with the participation of staff and students.